Occasionally, the home farm buildings are what stands out on an estate. That is the case at Refsnæs, for example, which we know dates back to the 14th century. The main building was not built until 1791, with side wings from various points in the 19th century. One of the Refsnæs home farm buildings is a half-timbered barn built in 1612. This huge barn is 100 metres long with room to drive wagons into the building for loading and unloading. Refsnæs was one of the manors that fell into the hands of a merchant when absolute monarchy was introduced and decreed that commoners could own manor houses. Before this, many landowners had fallen into debt to moneylenders from Holstein because the wealthy merchants in the Danish towns were reluctant to issue loans without bricks and mortar as security. When the rules changed in 1660, commoners were quick to step up, as in Refsnæs. By 1665, merchant Thøger Lassen from Aalborg had already bought Rødslet Manor, and in 1674 followed suit with Vester Ladegård near Aalborg. 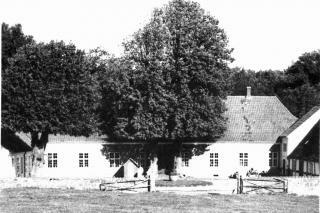 In 1682, the owner of Klarupgård finally gave up hope of paying back a loan to Thøger Lassen. This left the merchant with three manor houses before he married his way into Refsnæs in 1685. Manor houses were an eye-catching status symbol for their owners.